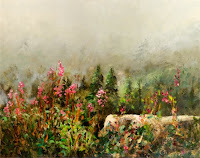 Hi All, here is part 2 of Home is where the art is. I have a new piece of art! 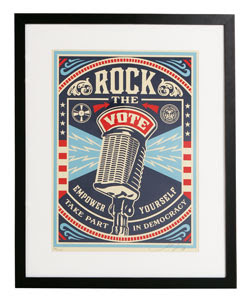 I got a signed copy of the Shepard Fairey Rock the Vote poster when we were at the convention. Finally got the framing done and it is proudly on my wall. Send me a pic a favorite piece from your home/ home office? Office? And I will post them up and we can all get a glimpse of each other's art-diggs. Take a look back at our previous thread on GNB home art here. 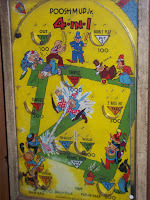 Sherry has a great vintage game (her uncle joe's) hanging on the game room wall! Cool. From Carl; silkscreen by Dutch artist Jacqueline de Jong (b.1939). She was associated with the Situationist movement from about 1957 to 1962, but has gone her own way since. This is called Pistol, from 1983. And from Steve K we have this one, framed and hanging.